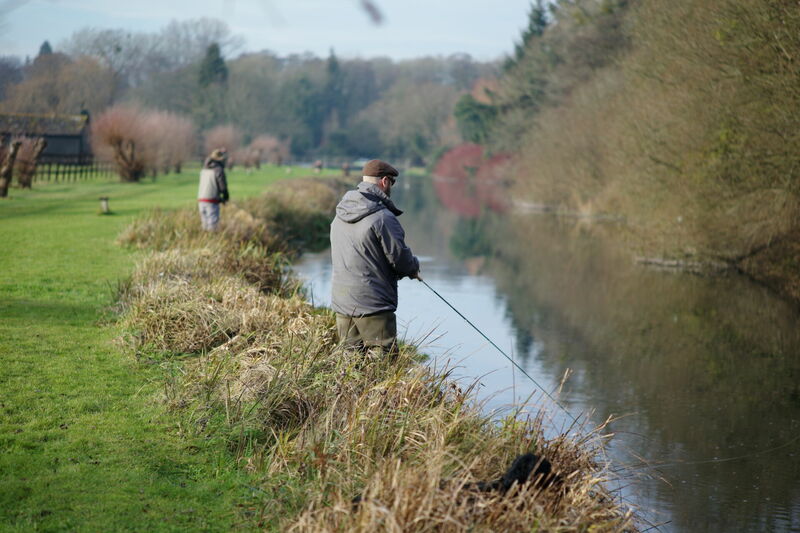 On a crisp winter’s morning, piscatorial enthusiasts congregated on Orvis UK’s idyllic Kimbridge beat to partake in a spot of grayling fishing. Belonging to a cold-water fish family of six sub-species, the grayling – Thymallus thymallus – can be found across areas within the Northern Hemisphere although is absent from Ireland. Proud owners of an adipose fin, grayling are typically smaller than trout though also belong to the salmonidae family. Grayling tend to spawn in spring in shallower redds and are often referred to as ‘bottom-feeders’, residing closer to the stream bed and favouring deeper, cooler water. Their dorsal fins are typically fringed in red and dotted with iridescent red, aqua or purple spots and markings, making the bigger ones in particular seem impressively dramatic. Their instinct to test almost anything that seems edible on the water’s surface, coupled with their tendency to ‘corkscrew’ when hooked and fiercely resist a take make them an incredibly exciting species to pursue. Historically, grayling were persecuted by trout anglers owing to the erroneous belief that grayling competed with trout for food and habitat – but modern research has revealed that each species feeds on different prey items and prefer different microhabitats, so they can rub along together in rivers and streams in harmony. Grayling must be on to something. Exclusively belonging to rivers, they seem to reside only in those that are most jaw-dropping. Grayling need clean, well-oxygenated water, so gin-clear limestone and chalk streams suit them perfectly, though northern rivers in Scotland and Wales fed by fresh water flowing down from the mountains also provide grayling habitat. Clarity and alkalinity seem to come hand in hand with beautiful views and scenic surroundings – and rivers such as the Tweed, the Tay, Dove, Wye and Itchen offer plentiful supplies of this fish. The River Test is renowned for its high alkalinity and clarity, and coupled with its rich aquatic insect and shrimp life, gives rise to a flourishing ecosystem. Our trip to the Kimbridge beat of the Test on a wintry December day and algae-free water made us hopeful that the grayling might be contentedly nestled in our stretch en masse. The grayling were there, and with their habit of shoaling, we expected flourishes of excitement rather than sporadic and lengthily-spaced moments of tension. Shoals mean that landing and returning a fish doesn’t tend to spoil the opportunity to take several more: find one and you’ve found many. Frosty grass crunched underfoot as a group of us headed off to punctuate the far bank, and we began to fish. I was keen to get advice from the experts. Nick Parker (on Instagram as @hampshireriverkeeper), was helpful enough to offer some words of wisdom on the basics of. Heavy flies and nymphs representing freshwater shrimps or caddis larvae seem to do the trick. Orvis London Store Fishing Manager Vito Rubino has found that the grayling love purple, pink and red colours whilst Orvis-endorsed guide Paul Procter suggests Red Tag, Treacle Parkin, Bradshaw’s Fancy and Grayling Blue Steel also work well. Tackle wise, Paul says that a rod used for river trouting will work for grayling, with whatever action suits the fisher best. I had no idea what action would suit me best and was grateful when advised to cast upstream and allow my nymph to drag back towards me with the current. The heavier the nymph not only the quicker its descent through the river but the faster its journey back along the river. Czech nymphing, which is a method of fishing with weighted nymphs at close range, is a popular method of fishing for grayling in streams that have depth. Whilst grayling tend to prefer colder water, the additional warmth achieved during a Winter’s midday can sometimes trigger flies to hatch, resulting in a rise and the subsequent revelation of grayling from the darker depths of the stream. As these hatches can last a mere matter of minutes, you have to be prepared to move fast during the flurry of activity. Tight lines and speedy reactions, I was advised, are essential. There seemed to be a variety of methods, flies and nymphs being tested on the river that day, and most resulted in success. I was lucky enough to be handed one of Orvis’ new Helios 3 rods and was intrigued by the complexity of achieving an appropriately placed cast that landed softly on the water’s surface. Whilst the rod was impressively light, I was at first stumped in my attempts to control the placement of my line. Unfortunately, watching others use the Helios 3 confirmed this had everything to do with my lack of skill and nothing to do with my kit. After a few trials I began to familiarise myself with the motion and found that due to the rod’s nimbleness and weight, my arm remained largely untired. In fact, when my cast was guided by fellow fishers, it began to land with spectacular precision upon the desired spot. Immensely satisfying – but not as satisfying as that first eager grayling that willingly snapped at my fly and found itself in the net a few moments later before being returned. All modern fly rods are powerful, but accuracy is the new frontier in design. Orvis’ Helios 3 claims to be more accurate than its predecessor, the Helios 2. And not just accurate in close where most of us are primarily concerned with accuracy, but way out there at the end of one’s casting range when the winds are blowing and the water becomes a choppy sea. Since the launch of Orvis’ Helios 2, they’ve tested over 60 new raw materials/resin systems and have settled with the best they could find – a material with just the right combination of stiffness and strength, allowing it to build a thinner and more precise blank that translates casting energy better than anything previously seen. Each of these bespoke and custom-finished split cane fly rods is hand split and elegantly styled in the English tradition. These rods (also known as bamboo fly rods) have a wonderfully smooth action and casting characteristics that make them a joy for grayling fishing within the traditional realms of streams and rivers. With improved casting efficiency, delicate presentation and aesthetic handling, water disruption is minimalised, leading to satisfying results. So why are these beautiful rods so special and wonderful to fish with? “We work with a bunch of cottage industries,” says Chris Clemes. “Some of our crafters are third generation and the skills have been passed down from their grandfathers. This skill is part of the magic of the rod’s craftsmanship, making the product the culmination of an unique process. Costa Del Mar’s sunglasses from Fin and Game will be the perfect accessory to keep the glare out of your eyes as sharp winter sunlight makes the water glint. Their men’s Bloke Polarised sunglasses are reliable due to their cam action pin hinges and Costa Del Mar’s bilateral fusion technology which fuses two colours for the chip-proof finish. Styled for keen anglers, the glasses are both stylish and practical. This Orvis Men’s Pro wading jacket is ideal for a day on the river – it’s breathable, waterproof, weatherproof and entirely ready to perform. £349 from Orvis – and the lightweight and breathable Encounter rain pants (£99) go with it perfectly. Rods at the ready! With spring on the way, our thoughts are turning to the exciting run-up to the only fair of its kind in the City of London. From the 23-24 March 2018, the Business Design Centre, Islington, will be home to the second annual London Fly Fishing Fair. Co-founded by John Kelley and his son, Fergus, and following a successful launch last year, the exhibition features fly fishing, outdoor lifestyle brands and experiences in central London. Among the exciting attractions include the indoor casting pool, taking centre stage and visible from all areas of the fair, with impressive displays and talks from some of the world’s best fly fishers and personalities including Charles Jardine, Hywel Morgan and Paul Procter, who will all be in attendance. With international exhibitors from as far afield as Argentina, all the way to Alaska, the fair is set to attract visitors from all over the UK and beyond. Returning exhibitors include Orvis, Fin and Game, Funky Fly Tying, Eleven Experience and Federation of Fly Fishers. New exhibitors include Farlows Travel, Sweet Water Travel, FishPal, Snowbee and Edward Barder, and Today’s Fly Fisher magazine, alongside 70+ more specialist exhibitors, fishing destinations and celebrated lifestyle brands. This year, a ticket to the London Fly Fishing Fair also grants entry to the inaugural London Wing Shooting Fair, held on the same dates in an adjacent hall at the Business Design Centre, offering a perfect day out in the city for the field sports enthusiast.